If you are new to woodworking, building and making items from a set of plans, it is important to understand how to read a woodworking plan. There are hard and fast rules that a designer should use when creating a set of woodworking plans that can be read by others. However, many plans that you will find on the internet and in books are not created using proper drafting rules, because of this it is very important that before you start any project that you look at the plans carefully and determine if all of the dimensions are actually shown on the drawings. 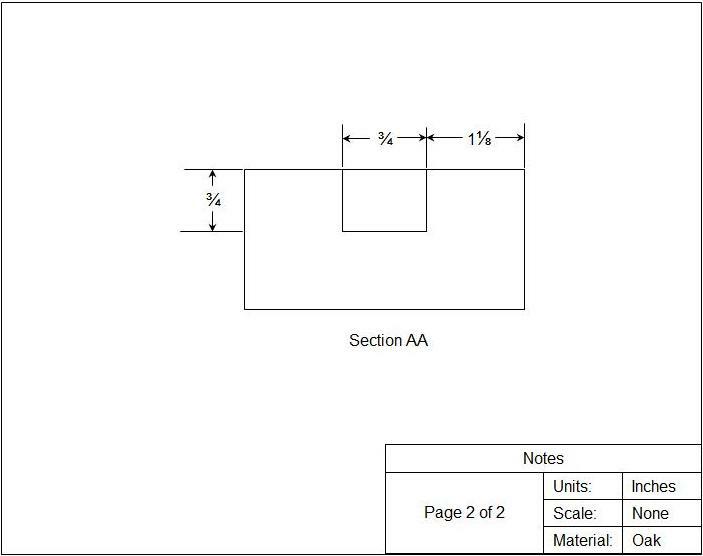 Figure 1 shows a drawing of a piece of wood. A set of woodworking plans for this block of wood should appear very similar to Figure 2. 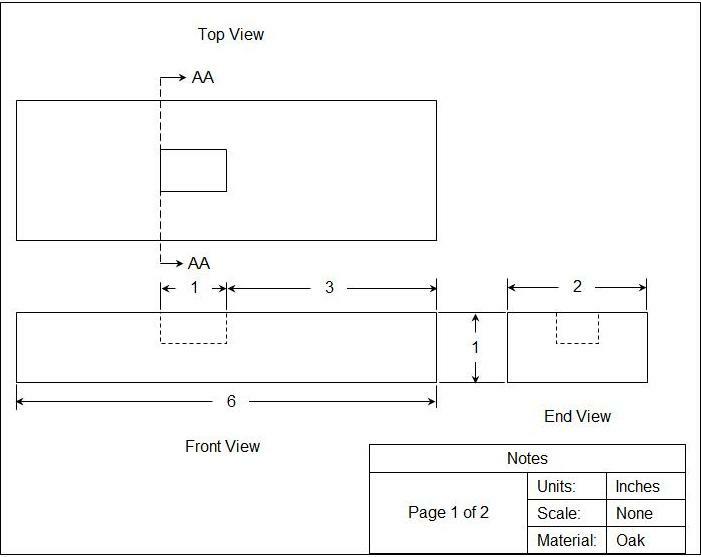 It may also be necessary to show exploded views of sections of the object in order to show detail that may be difficult or too small to render in the three primary views. 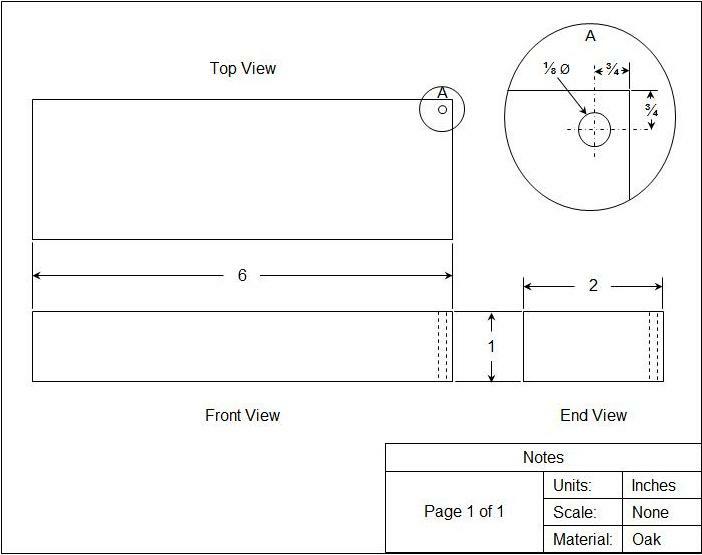 An exploded view is shown with a circle around the section on one of the primary views and identified with a capital letter. The section that has been circled on one of the primary views is then shown in a larger format in order to show the details, as shown in Figure 3. Finally it may be necessary to show one or more cut view through the object, because an element is not rendered in any of the primary views. A cut view is shown by a line with right-angle arrows and has a letter placed at the tip of the arrow, as shown in Figure 4. The cut view is then shown on another page or another area of the woodworking plans. The arrows show the direction that the cut view is to be viewed. 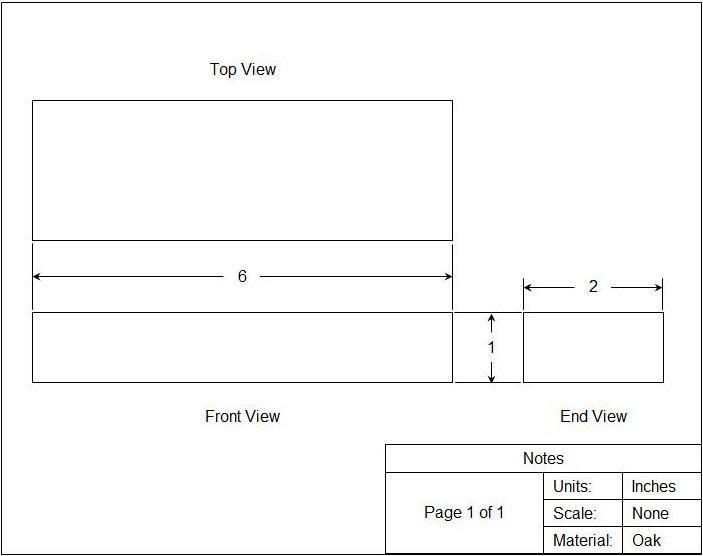 Figure 5, which is page 2 of our woodworking plans example, shows the cut view AA . Figure 5 - Woodworking plans showing cut view detail of section "AA"
The actual woodworking plans should not be in color. The woodworking plan or drawing should state whether or not it is to scale and if it is to scale, what the scale used is. If the woodworking plan does not state that it is to scale you should never take measurements off the woodworking plans by using a ruler. Note: Woodworking plans that are taken from the internet should never be considered to be drawn to scale even if they draftsperson who made the woodworking plans states that they are. The reason is that computers have a tendency to change the drawing perspective somewhat when a drawing is printed. Computer print commands such as fit to page may change the scale and make actually lengthen or shorten the object in the drawing. If you want to test a set of woodworking plans to see if they are to scale, measure horizontal and vertical defined measurements and see if they match the scale – exactly. If they do not, the drawing has been skewed out of scale, when it was printed. Dimensions should always be placed outside of the object that is being drawn. In many cases the draftsperson that is making the set of woodworking plans will not put the word or symbol for inches. The notes on the drawing should state the units, they may be metric. Where woodworking plans need to use larger dimensions of feet and inches they should never be in decimal format. The number should always identify the number of feet and inches even if there are no units. As an example the numerical indication for nine feet and three inches would be 9.3 or 9/3 or 9-3 . If the dimension was nine feet with zero inches the number would be displayed as 9.0 or 9/0 or 9-0 . In other words the amount of inches is always shown. When dealing with inches a part of an inch should be shown as a fraction not a decimal point. As an example; one and one half inches should be shown as 1 1/2 not as 1.5. Fractions should always be those found on a tape measure; 1/2, 1/4, 1/8, 1/16, 1/32 and 1/64. You should never see fractions such as 1/3, 1/5, 1/6, 1/7, 1/9, 1/10 or 1/11 or multiples of those fractions. In general woodworking plans that have dimensions of less than eight feet in all directions will be dimensioned in inches, not feet and inches. Remember the old adage; you get what you pay for . Free woodworking plans may have errors and/or missing information. One of the biggest errors on many woodworking plans is missing dimensions. While some dimensions can be worked out from dimensions that are shown in some cases it is impossible to determine what a missing dimension is. Always make sure, before you invest in materials, that you have all of the information you require to complete the project from the woodworking plans, the notes and/or the instructions provided.